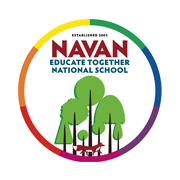 New logo for Navan Educate Together National School. I'm not taking much credit for this, it was a whole school effort. The children submitted over 100 designs. I then identified the most popular themes and colours and came up with about 12 different options. These were narrowed down until finally we arrived at the one you see above. The school is moving to a brand new building and only then will the transition to this logo be complete.